Posted January 31, 2012 in Uncategorized. Jimmy Olsen # 139, Page 6. Posted January 30, 2012 in Uncategorized. Devil Dinosaur #7, Page 23. Kirby/Royer. I love the giant afro on Cave Woman. Posted January 29, 2012 in Uncategorized. Captain Victory # 10 (Apr 1983), Page 6. Kirby/Thibodeaux. Posted January 28, 2012 in Uncategorized. Posted January 27, 2012 in Uncategorized. 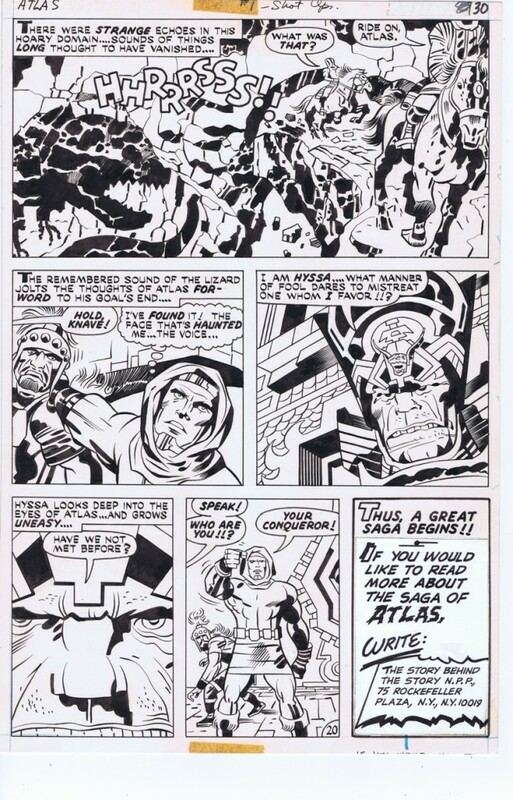 Original art scan of the final page in Jack’s First Issue Special # 1 (April 1975), “Atlas” story. Kirby/Berry. Atlas was a perfect example of how Jack could take any concept and turn it into a compelling storyline. I’ve said many times in the past that the dumbest thing Marvel and DC did was to not have Jack work on a book like First Issue Special on a regular basis. 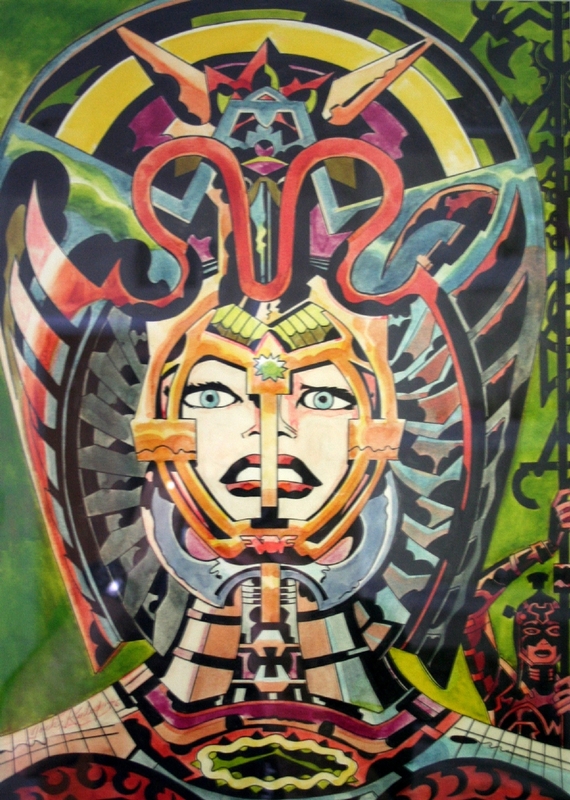 Imagine if Jack had done 100 issues of this series — that would have been 100 unique Kirby concepts featuring a pantheon of original characters those companies could have exploited. Having Jack work on a regular book with a set cast of characters was almost a waste of his creative skills. This single issue of Atlas scratches the surface of what Jack could have done in comics if someone in the late 1970s had recognized the value of his extraordinary talent for creating new comics series. Posted January 26, 2012 in Uncategorized. 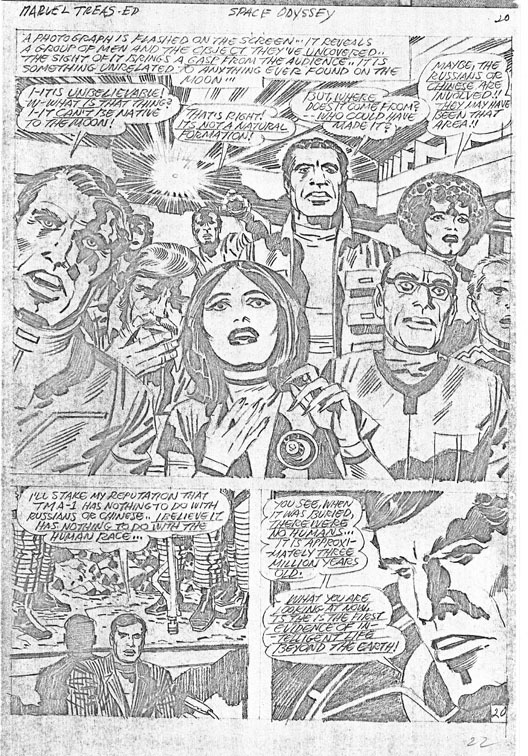 Beautiful uninked pencil art scan of a Kirby crowd scene from the 2001 Treasury Edition (1976). Posted January 25, 2012 in Uncategorized. 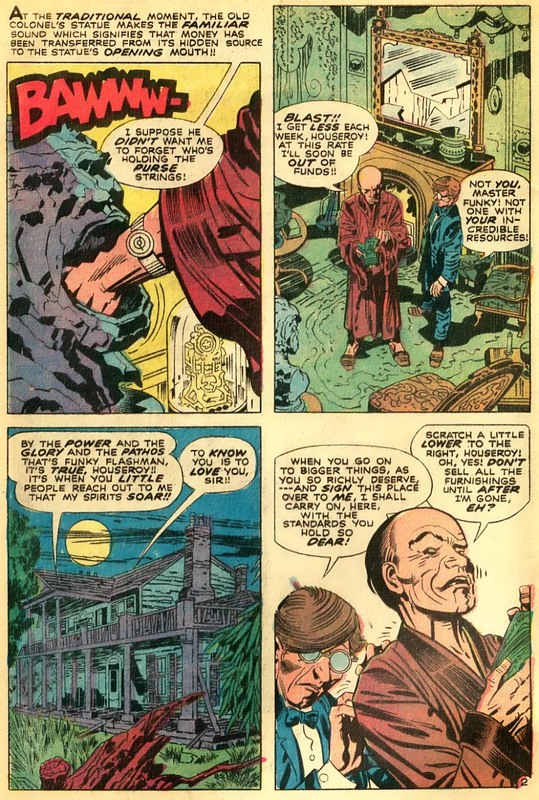 I read the Kirby/Lee comics as reprints as a little kid in the 1970s, I have wonderful memories of the Kirby/Lee comics as well, buying them off the spinner racks at the 7-11 at the top of the hill, reading them in the backyard on a cool spring afternoon, and nothing will change those great memories. But as an adult, I’m interested in the real history behind those comics, not the propaganda in something like Lee’s Origins books or the self-promotion in Lee’s Bullpen Bulletins. Studying the actual history to me is enlightening. Based on my research, I suspect Lee and Kirby got along pretty well from 1960 – 1968. I doubt they were buddies hanging out at Yankees games, or going on vacations at the Hamptons, but I think they had a cordial, polite boss/employee working relationship. Certainly Jack would have loved to dialogue his books and collect the writer paycheck — and the fact that Lee would not let him do this must have been very frustrating — but Lee did give Jack plenty of work so Jack probably appreciated having the chance to make some good money. We have to remember Stan Lee was Jack’s boss — they were only “partners” in the comics credit box — they were not financial partners or business partners. When Jack realized he wasn’t going to get any royalties for his 60s Marvel creations, and it became increasing clear to him Lee was taking 100% of the credit for creating all the major Marvel characters — Jack stopped giving Lee and Goodman new characters, and eventually Jack left for DC. I doubt Lee and Kirby saw much of each other after that. Maybe they crossed paths once or twice at conventions. 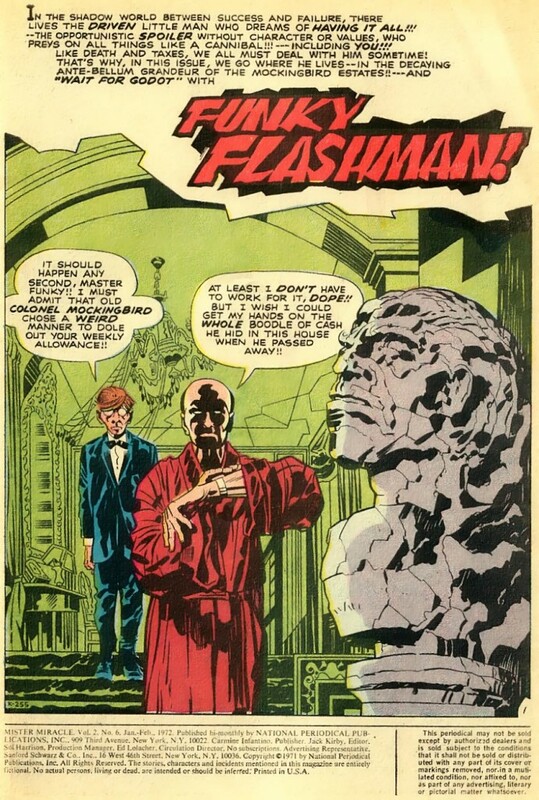 They did work on the Silver Surfer Graphic Novel (1978) together which probably consisted of some phone conversations, but other than that, after the 1970s, Kirby and Lee lived totally separate lives… although their names would be linked forever in the minds of comics fans who loved their work. I don’t know if there was “enmity” between Kirby and Lee. “Enmity” being hated or ill-will. Stan has talking points he has been sticking to for decades, so it’s really difficult to know how he feels about Jack (or anything for that matter). Lee basically won the lottery — Marvel has been paying him millions of dollars a year to maintain his solo-genius, creator persona so I can’t imagine why Lee would feel any anger or hatred towards Jack, or anyone. You’d have to think Stan Lee must be one of the happiest people in the world. Apparently, starting in the late-1960s, Jack was pretty angry at Stan for a long list of reasons, so if there was “enmity” if was pretty one-sided. 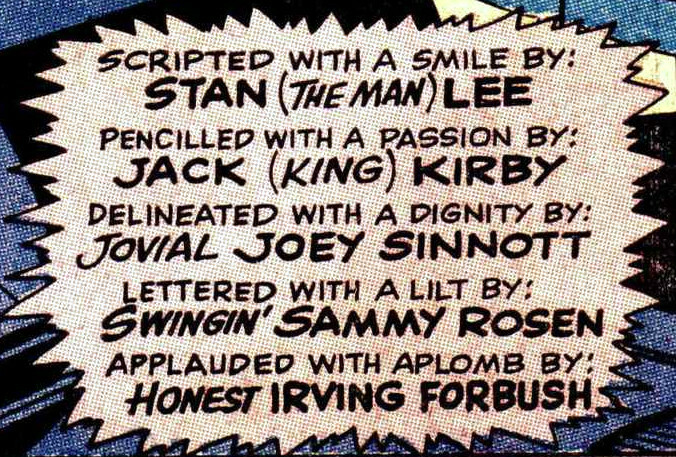 I don’t know if Kirby “hated” Stan Lee though, but I do think it was incredibly upsetting and deeply painful for Jack to see Lee taking 100% of the credit for Kirby stories and 100% of the credit for Jack’s creations. So I don’t think enmity is the right word, Stan and Jack remind me more of a divorced couple: one member of the marriage (Stan) got an incredible deal, made a tremendous amount of money from the relationship, and completely moved on. The other half of the couple (Jack) got a bad deal, felt tremendous bitterness at times, but still went on to live a happy, productive, and fruitful life. I’m sure all of you may know several couples like that — I know I do. So I hope I’m not suggesting Lee and Kirby hated each other. There is evidence Jack was pretty angry at Lee at times, but I don’t think you could call that “hate,” in the way, say, Osama Bin Laden hated America. For Jack, there were probably just moments of anger that would pass like a short storm. One other thing: although maybe I come of as a “Stan Hater” at times, all I can say is that I’m not. I find Stan funny — he reminds me a lot of Rodney Dangerfield doing his shtick. It’s just that Stan never comes out of character, or that “Smilin’ Stan” character has really become his persona. Either way, I’m very critical of Stan because his story is so full of holes, not because I hate him. I made fun of George Bush for sending us to Iraq claiming there were WMDs; I made fun of Clinton for lying about Monica Lewinsky; I make fun of Tiger Woods, Oprah, you name it. I don’t hate any of those people, I just like picking on public figures, because it’s fun, and we all do it to a degree. Everybody I have ever met makes fun of somebody. Satire and parody is one of the great things about living in a country like America where we have a large degree of freedom of speech. And of course I could be wrong about a lot of things, we’ll never really know what took place between Kirby and Lee unless the CIA wiretapped their phones and we have tape recordings of their conversations. I’m just a humble FOK (Fan of Kirby) giving my 2 cents, so I hope everyone will please take my opinions with a grain of salt. I certainly hope I’m not ruining anyones childhood memories of reading Kirby/Lee comics, I hope you all will always relish and smile at those memories. And of course if Stan Lee wants to respond to some of my remarks, he’s more than welcome. We’d all love to hear from him. 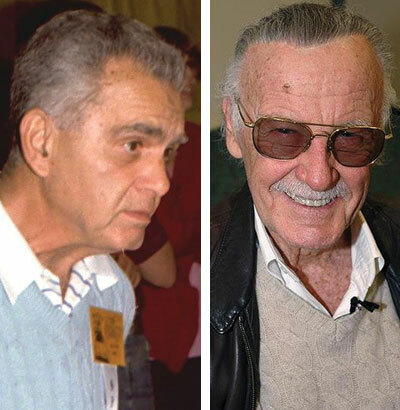 Anything new we could learn from Stan about the Kirby/Lee collaboration would be wonderful. My apologies to the Kirby Purists for adding graffiti to Jack’s beautiful artwork. I thought it would be fun to do an experiment and add text to the balloons to see how the size of the balloons dictated the amount of text you can add. It took me about 10 seconds to do this. I suspect Lee was probably a lot faster at it based on his years of practice. It took Jack about 2 or 3 hours to illustrate a page, so Jack spent about 2 weeks illustrating a book. 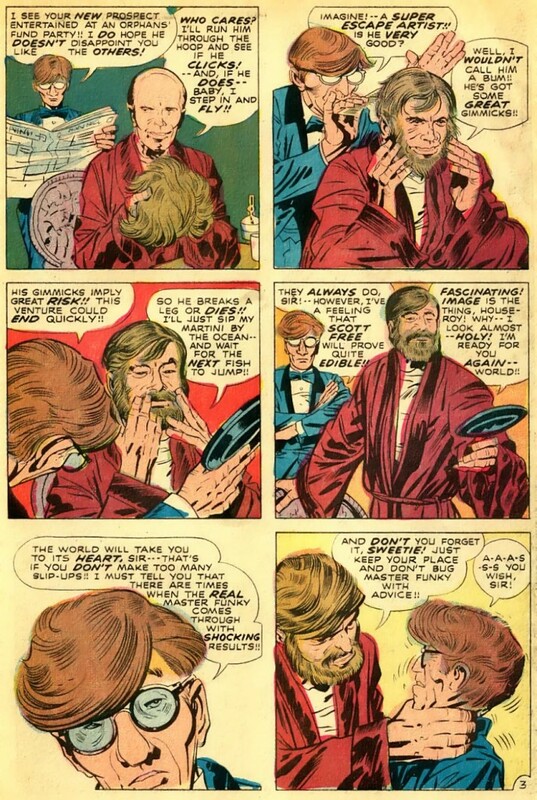 Mark Evanier told me years ago that it took Jack “the better part of a day” to add captions to his 1970s stories, so I’ll guess it took Stan Lee about 4 or 5 (or less) hours to add dialogue to one of Jack’s 60s stories. 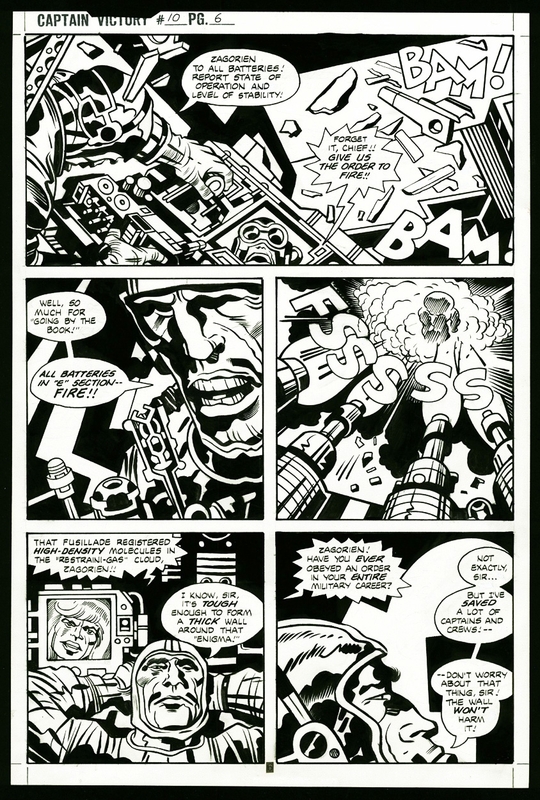 Jack spent about 60 – 70 hours writing a 20-page story with visuals and margin notes; Stan Lee spent maybe 4 – 5 hours adding captions to Jack’s entire story. Then Stan Lee gave himself an “Editor” credit and an Editor paycheck, in addition to using his power as the Editor to give himself a sole “Writer” credit and 100% of the Writer paycheck. Pretty good deal for Stan. 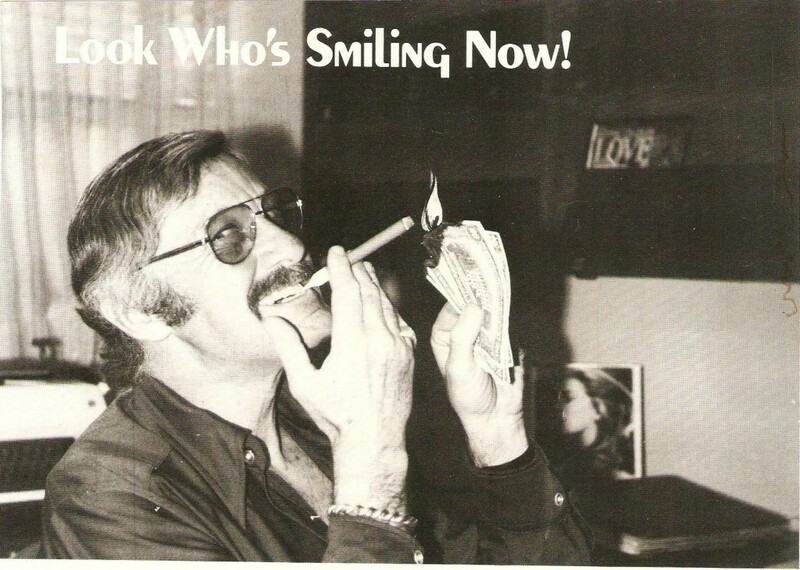 The image of Stan lighting the cigar with burning money is from a 1975 advertisement for Crazy magazine. 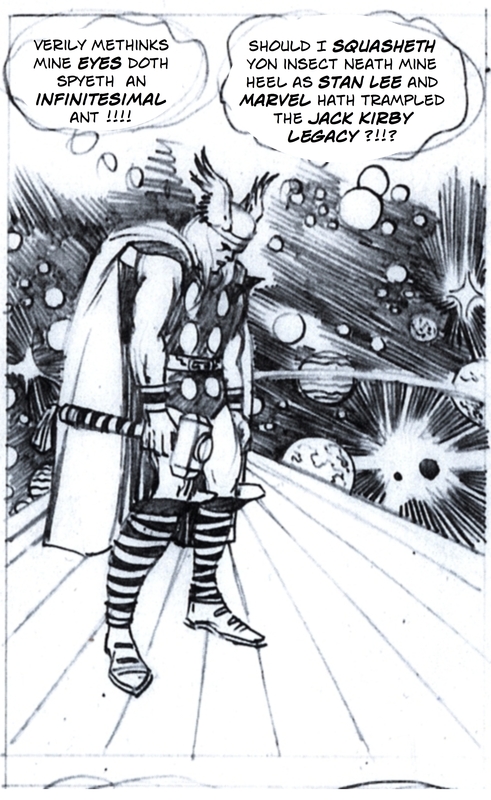 Some unpublished Thor pencils. You can see here how Jack would leave Stan Lee room at the top of the panels, this is where Lee would add the captions. Notice all the detail in the outer space background in the first frame. Lots of circles, planets, starbursts, and flashes of light. 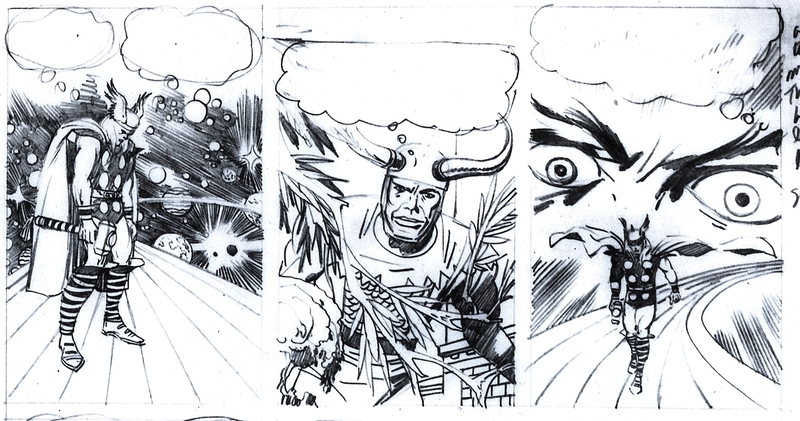 Classic cosmic Kirby. Looking at many of the published Thor comics, I think Thor inker Vince Colletta obscured a significant amount of these types of details with black in order to save time. Look at how Jack gave Stan a little extra room at the top of panel 1 under the thought balloons in case Stan wanted to add extra text, or if not, the inker could fill in the area with black if the balloons remained small. I’ve noticed that inkers like Sinnott and Royer tried to match the patterns in Jack’s penciled backgrounds and they would add some more Kirby cosmic crackle in those small blank areas next to the balloons to make the background consistent. This artwork is an example of one of the reasons I have argued that Lee was not giving Jack a script — if Lee gave Jack a script for this story, Jack could have written Lee’s dialogue into the balloons, then Jack would have known exactly how much room he had to work with (or Jack could have estimated the available space left for his artwork). I believe this is a typical example of how Kirby/Lee worked: Jack wrote the story with visuals, Jack then added margin notes to give Lee direction, Jack left Lee room at the top of the panels for blurbs, Jack mailed his stories to NYC, then Lee filled in Jack’s balloons (or the blank space left by Jack) with text. I’ve always suspected that the amount of room Jack left Stan at the top of the panels also played a significant role in the amount of text Lee wrote. 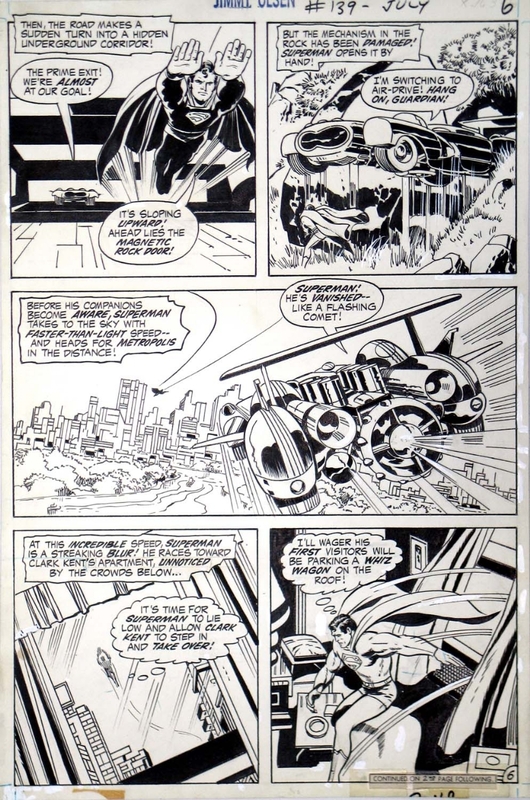 There are only so many words you can fit in that space, plus you have to make the text look balanced and centered, so Jack’s compositions must have influenced to some degree the amount of text Stan could fit on a page. This appears to be a sequence that must have been cut out of a story. It would be interesting to know why these panels were rejected and what replaced them. You can see a piece of Jack’s margin notes off to the top-right. If anyone has a scan of the actual original artwork of this piece (this appears to be a B/W scan or a photocopy) please send it in. Posted January 24, 2012 in Uncategorized. Thanks for the comment. I hope you don’t mind me posting it here, and I also hope you don’t mind me using it as a springboard to say a few more things. As I mentioned at the beginning of that post, my main goal for the Kirby Dynamics weblog is to focus on Jack’s artwork, so I try and keep my own commentary to a minimum, but the weblog is still an ongoing experiment for me, so once in awhile I might try different things like yesterdays “rant.” That was a kind of a little behind-the-scenes glimpse into the arguments and debates that rage amongst comics fans, collectors, and historians usually off the record. I actually commend Tony Isabella for going on the record with his “Kirby Zealots” remarks, a lot of comics fans make these kind of accusations hiding behind pseudonyms or on private chat lists where they can censor anyone who stands up to them. I think the main reason I posted the “Kirby Zealots” comments at Kirby Dynamics instead of just emailing them to Tony Isabella is that I wanted to basically challenge Tony Isabella on this. He’s claiming there are “Kirby Zealots” out there, but who are they? What exactly makes one a Kirby Zealot? Is there a criteria? Criticizing Stan Lee? Is that what makes one a Kirby Zealot? That post was me basically saying, (Jerry Seinfeld voice) “Who are these people?” It was a little long, so sorry about that. And the, “did a 10-year-old hack into your computer” line was also probably rude. My apologies for that as well. We’re all hypocrites to an extent. Nobody’s perfect. I’m certainly not above admitting when I’m wrong, or apologizing when I’m wrong. Isabella’s comments weren’t “upsetting” to me personally, mainly I found them amusing because they were so hypocritical. In one breath you complain about people who “disparage” a man like Stan Lee, then you spend a whole post “disparaging” several unnamed Kirby fans? I dunno, I thought it was funny. But we all have a different sense of humor I suppose, and I realize many of you come here to see great Kirby art, not comic book collector infighting, so to the FaceBook commenter: great point. Mainly I wanted to point out: I think it’s disrespectful to dismiss Jack’s fans, friends, associates and Kirby historians as “zealots” because they question the veracity of Stan Lee’s version of the history. In my opinion Mr. Isabella’s comments are sorta’… pitiful. Kinda’ like the little kid who’s scared of the imaginary monster under the bed, so he hides under the covers shivering in fear. If Tonly looks under the bed, he’ll see there are no Kirby Zealots under there. So to Tony Isabella, I say: write all you want about Kirby and Ditko, ignore the “Kirby Zealots” you feel are out there ruining your fun. Does Tony really feel the “Kirby Zealots” are hurting the quality of his life? Let’s buy the guy a one-way ticket to Iran and let him live in a torture chamber for a few years if he wants to deal with some real adversity. I’m just trying to keep things in perspective here. Terrorists who crash planes into the World Trade Center are bad; people who say Jack helped Stan create Spider-man… ain’t so awful. 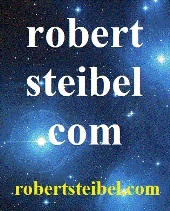 The “zealot” concept itself is silly: If I’m going to vote for Obama and I criticize Gingrich am I an “Obama Zealot?” Or if I’m going to vote for Gingrich and I criticize Obama, am I a “Gingrich Zealot?” I just find it humorous that some of Stan Lee’s fans feel Lee’s critics are “zealots.” I’d genuinely like to know from Mr. Isabella if I’m a Kirby Zealot. I genuinely don’t know. I guess I am? I’m a “Kirby Zealot?” Who knew. I want to know! So the “Kirby Zealots” post wasn’t a rant based on an upsetting weblog post, it was me reflecting on what I see as an almost elementary school playground mentality you see in comics’ fandom where Stan Lee’s supporters call Kirby fans mean names like “Kirby Zealots.” I say: instead of taking the low road by demonizing your critics with silly kindergarten names like “Kirby Krowders,” “Kirby Kultists,” or “Kirby Krusaders,” (believe it or not, I’ve seen all of those terms used to describe Kirby fans over the years), take the high road and engage the individual in a dialogue. I’d love for Tony Isabella to email me and explain to all of us here reading Kirby Dynamics: who the Kirby Zealots are and what they are doing that is so terrible? Maybe we can shake hands and agree it’s okay to criticize Stan Lee’s version of the history — freedom of speech and all that jazz? My main goal for the Kirby Dynamics weblog is to focus on Jack’s art, but I really enjoy debating Jack’s critics. I don’t do it too often here because I’m trying to reach the 7 billion people of planet earth with the typical post, and I suspect there are probably only 10 or 20 people out there who are interested in the petty name calling that takes place amongst comic book fans, so I doubt you will see too many more “rants” about comic book collectors from me here. And of course, the ultimate irony of all of this: if Mr. Isabella does designate someone like me as a member of the “Kirby Zealots,” if Mr. Isabella says, yes, he sees me as some kind of “Stan-Basher,” well… I’d be in pretty @#$%ing good company… here is the original Kirby Zealot himself, Mr. Kirby, doing some satire featuring his former Fearless Leader. The first three pages featuring the introduction of Funky Flashman from Mr. 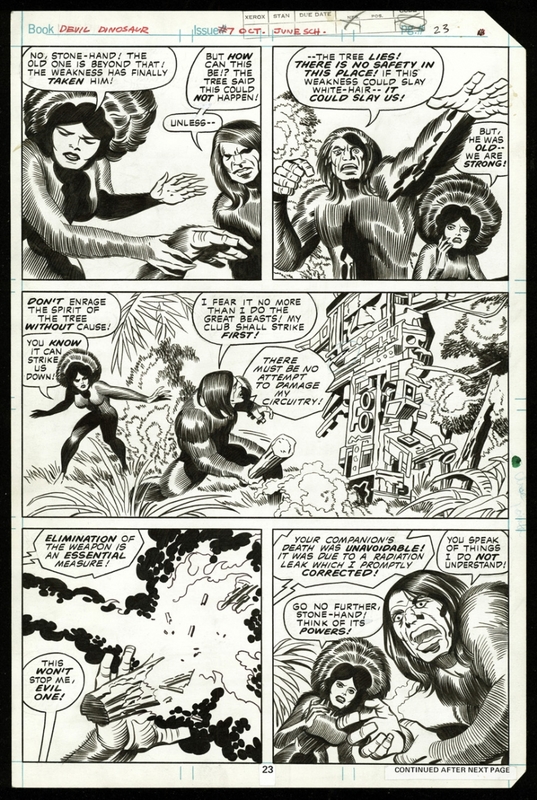 Miracle # 6 (Jan-Feb 1972), terrific Royer inks. Funky doing what he continues to do to this very day — counting his dirty money.